Hot Turkey Sandwiches on Friday is set in stone, here. On Saturday there usually are a few pieces remaining. That's when I see Turkey a la King in our future. 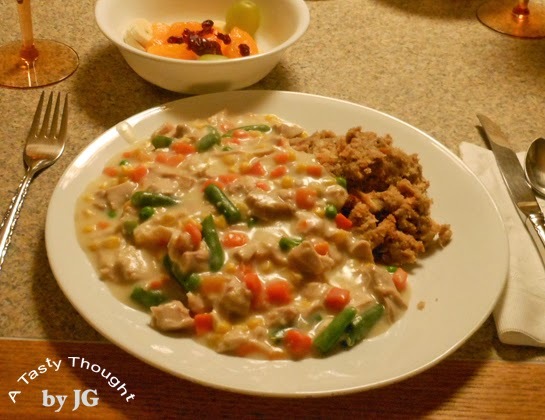 Mixed vegetables along with chunks of Turkey combined in a creamy white sauce. This is served over toasted Oatmeal Bread. Oh yes, along with Cranberry Sauce. Yum, yum, yum! When preparing dinner why take the extra step of making or using commercial pie crusts for Turkey Pot Pies??? Toasted bread serves the role so well! Prep Turkey a la King. When it's ready, toast the bread. Easy & no fuss all while tasting absolutely delicious! Try it, you'll like it! Melt Margarine/ Butter in skillet. If I have enough Turkey I make a double batch & freeze the extra portions. 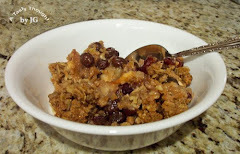 It's an easy dinner to defrost/ reheat on a cold winter night. ***Chicken can be substituted for Turkey at other times during the year. ***A half portion is also so yummy when served over a baked potato! Wishing you, your family & friends a wonderful holiday! Last Friday was the designated day for me. Our weather has been quite brisk lately with the exception of Monday's rain. On our garage floor were 5 Butternut Squash remaining in the carton. They needed to be prepped for our freezer. It's always best to take care of that before our cold temps make an appearance. 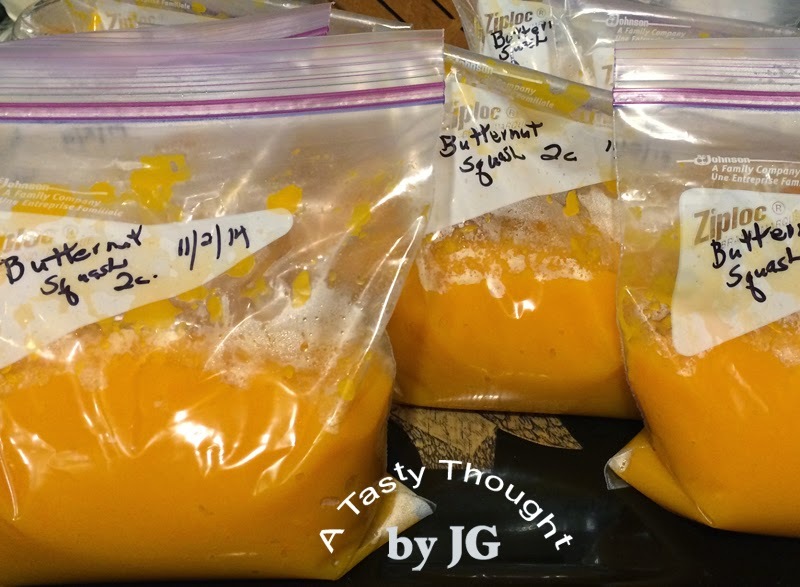 So... more bags of yummy locally grown Butternut Squash that is mashed/ ready to microwave is now in our freezer. This week's been cold, brrrr! 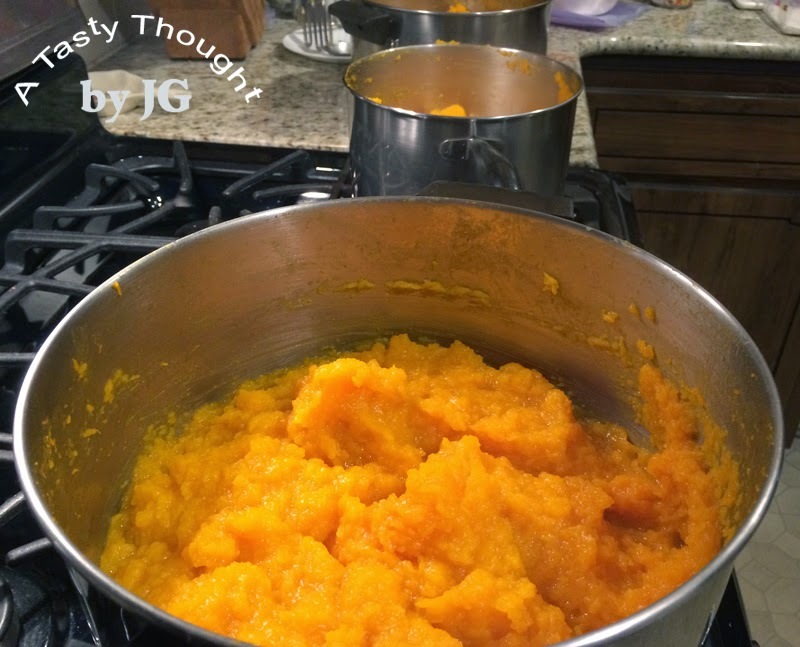 2 Cups of the mashed Squash were refrigerated. I had plans- Butternut Squash Breads! It's a tradition with me to use Butternut Squash rather than Pumpkin for breads & pies. It's a baking custom in my family. Now, as long as my bowls & measuring utensils were to be used for baking, I baked 2 breads. One is always cooled/ wrapped/ placed in the freezer for Thanksgiving weekend. Butternut Squash works so well in this recipe. However, if you do not have this yummy mashed vegetable readily available, use Pumpkin! Egg Whites rather than a Whole Egg is used. The recipe below is for 1 Bread. It's definitely a family fave here! Light & moisty! Spray 1 large bread pan with PAM. Pour batter into bread pan. Then remove from pan & continue cooling. Later, place on plate & cut into slices. 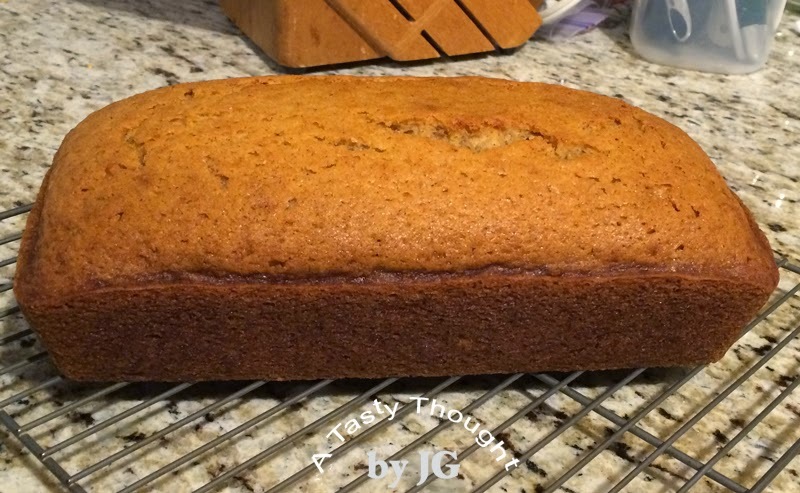 We always enjoy Butternut Squash Bread during Thanksgiving weekend. It's also a holiday treat that can be baked/ cooled/ wrapped in foil & placed in the freezer. When needed, defrost. Do you have 1 and 3/4 Cups of Buttermilk in your fridge? Do you have 1 Cup + 3/4 Cup Milk? That small amount of Buttermilk is the beginning of a delicious breakfast! About a month ago after opening the door to one of my kitchen cabinets, suddenly I "spied" my Belgian Waffle Maker! It's only been "untouched" for about 6 years! Other than taking it down when cleaning the cabinet shelves. Remembering that I had Buttermilk in my fridge, the next step- King Arthur Flour's website. There it was- a recipe for Buttermilk Belgian Waffles! The photo looked so yummy & I had the Buttermilk! I use King Arthur Unbleached Flour whenever I make pancakes. My less cholesterol habit: Substitute Olive Oil for sauteing & baking for Butter. Another less cholesterol habit: Rather than 2 whole Eggs, I'd use 1 whole Egg + 2 Egg Whites. I was on my way to make a very yummy breakfast. By using the Olive Oil, no butter/ margarine was needed at our table either- only a topping. What delicious waffles! The second time I prepared these waffles for breakfast, defrosted strawberries were a great topping! No, we did not devour the entire batch! The extra waffles were cooled & wrapped in plastic wrap/ placed in Freezer bags for even quicker breakfasts other mornings. My method of reheating: my microwave. The holidays are in our future! 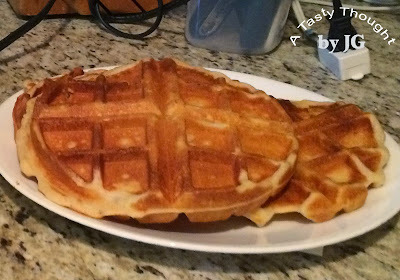 If you are looking for a quick, easy & absolutely yummy breakfast to serve your overnight guests Buttermilk Belgian Waffles are great! Take out your waffle maker! If you don't have one, that small appliance would be a great gift to receive! My waffle maker is at least 15 years old. Make & try these. They are so good! Crispy on the outside, soft on the inside! In a large bowl combine Flour, Sugar, Baking Powder, Baking Soda & Salt. In a smaller bowl beat 1 Egg + 2 Egg Whites. Add Buttermilk, Olive Oil & Vanilla. Add liquid ingredients to dry ingredients, stirring until almost smooth. 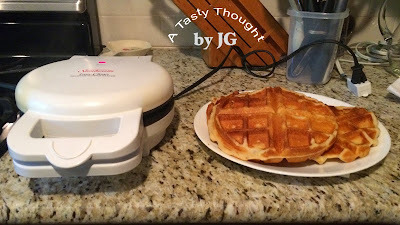 Spray Belgian Waffle Maker with PAM before preheating, only when making 1st waffle in batch. When Waffle Maker is hot, use 2/3 Cup batter to make waffle. Close lid. Cook for 2- 3 minutes - until steaming stops. ***One AM I had only 1 Cup Buttermilk, so I also used 3/4 Cup Milk & the waffles were also oh, so good! Using the Olive Oil, no butter/ margarine is needed. Maple syrup or Strawberries are our fave toppings! What will yours be? It's definitely like clockwork! In October my DH & I purchase a bushel of Butternut Squash from Meadowbrook Farm in East Longmeadow. One of our local grocery stores does purchase their supply there, also, but we go "farm to table" ourselves. The carton is stored in our garage. It's all part of the plan! All summer we've dined on locally grown vegetables. It is definitely a change in the taste when we buy them the remainder of the year at our grocery stores! Butternut Squash is one of my fave vegetables! You remember my story: Growing up my family had 2 large vegetable gardens. We canned & froze the year's supply of our veggies. The gorgeous Butternuts were one of our last harvests. Preparing these vegetables & freezing them to enjoy the remainder of the year was definitely a tradition for me. As newlyweds my DH & I had a great garden when we rented our apartment here in Western Mass. Our kind landlord plowed a small section of his beautiful lawn, so I could have my garden. My DH learned about growing veggies & got hooked on the fresh food. Our corn smelled so good that the local cows visited one day- much to our surprise. My DH had grown up in Queens, NY, so it was shocking to see the cows in our garden eating! Definitely not a common sight in one of the boroughs! This past Sunday the Patriots were playing the Broncos & my pots of peeled/ prepared Butternuts were on the stove simmering. It was time to start tackling that bushel in the garage! 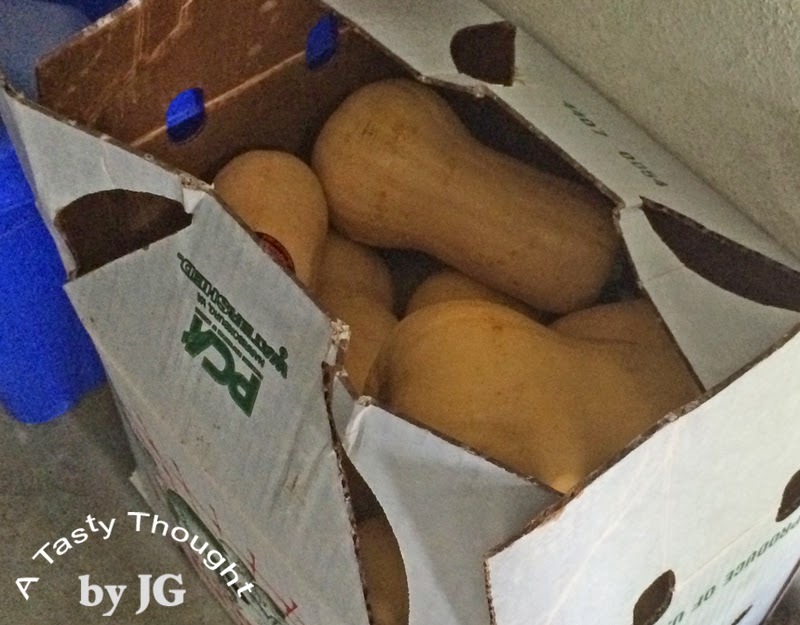 Our weather has gotten colder & the squash needs to be prepared for the freezer. Even during an exciting football game the tradition lives on! A good sous chef is an added plus, here! Rinse/ clean the Butternut Squash under cold running water. Using a cutting board & a sharp knife, cut off & toss the stem and rounded top. The long top portion is cut into slices. The slices are circles. Cut the peel off & discard. Cut each peeled circle into 2" chunks and place in large Dutch Oven/ pot. The lower portion containing seeds remains. Remove the seeds with a spoon. I save as much of the orange vegetable as possible that surrounds the seeds. Cut off the peel. Cut into pieces & place in Dutch Oven/ pot. Add cold water to container (so it reaches about 2" up in the pot). After a Boil is reached, lower the heat and simmer about 12 - 15 minutes, until pieces can be pierced with a fork. During the cooking minutes, carefully stir the Squash pieces often in the pot, so they soften equally. Drain the squash using a colander. Return the chunks to the large pot and mash. 16. Cool until comfortable to pack in Ziploc Freezer Bags. 17. Pack about 2 Cups of mashed Squash in Ziploc Freezer Bags. 18. After labeling, store in freezer. Do you freeze Butternut Squash? It's a very tasty veggie at dinner during the colder months.